2. A black, chalky byproduct of iron ore produced in smelting. 3. A delicious treat made of spent beer yeast and spread on toast. Well, this being Beervana, the answer isn't much in doubt, but admit it--you didn't actually know, did you? The basic production method has changed little since Marmite was first invented. Basically, the used brewer's yeast is broken down to release soluble amino acids and proteins. This soluble material is then concentrated and filtered a few times before going through a unique (and top secret) process for flavour development. At the end of all this, we end up with yeast extract paste - nearly Marmite but not quite. The finishing touches make all the difference. We add an extra blend of vitamins, vegetable and spice extracts to create the taste your mouth adores! I learned of this product while meandering through the byways of the blogosphere and discovered that Guinness put out a limited edition batch of their own marmite earlier this year--for St. Patrick's, naturally. Curious, I delved more deeply into marmitology. Turns out it is a 100-year-old product (with earlier, pre-commercial versions dating back 400 years) with a status something like Spam in America. 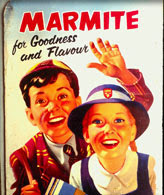 Mostly it's gross, but for the avid few who promote marmite, that, apparently, is it's charm. 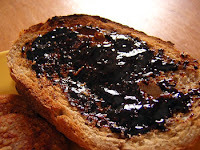 Said one site: "Usually, it's spread thinly on toast, and for those who like it, it has a salty, almost meaty flavor. For those who don't, the flavor is more akin to that of earwax." Mmmm, thin meat spread, tasty. It is vegan, however, which raises the question--is there a market in Beervana? Perhaps, in conjunction with Roots Organic, say, a Hawthorne store could find a market. I know I'm dying to try it. A couple months ago, I got an email from a breweriana collecter in Florida who had come across a Schludwiller label. 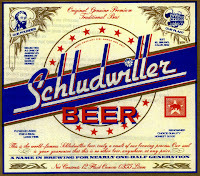 As Oregonians know, Schludwiller was the fictional California brewery mocked in 70s-era Henry Weinhard ads. This raises a few questions. Among the most obvious: why would a fictional brewery have beer labels? The guy who queried me about this (Daniel) also wondered: "Why was a label made up for this beer? Did they use them on bottles in a commercial? And why was the name Schudwiller chosen?" All worthy questions. Anyone have any clue? If you click on the label to the right, you'll see a larger version of it. I don't have any great reward to offer--just the satisfaction of visiting upon the world (and Daniel) your insight to this lost trivia. "Plywood aged for a real long time"
"Selected as one of America's beers at the 1967 World Series"
"A name in brewing for nearly one-half generation"
There's also a motto in Latin, "Quod nesciunt sibi damno non erit," which Daniel translated to (roughly) "Condemn not they who are ignorant," which is a high level of mockery by any standard. So, what do you know about this? Reply in comments or via email. Any info will do; I think Daniel would even be happy if we pointed him in the right direction. The Collaborator Project is announcing its current release of "Continuum Brown Ale." (Collaborator, you'll recall from my Snow Plow review, is a partnership between the Brew Crew, a Portland homebrew club, and Widmer.) The beer will debut tonight at the Brooklyn Park Pub (3400 SE Milwaukie Ave.). The homebrewer who created the recipe is named Scott Sanders, and he'll join Rob Widmer at the pub from 6-9pm. I believe the style is an English brown ale. Conspiracy is a collaboration brew between Midnight Sun Brewing and Pelican Pub & Brewery. During a trip to Alaska for the Great Alaskan Beer & Barley Wine Fest, Ben Love of Pelican conspired with Gabe Fletcher and Ben Johnson of Midnight Sun to brew a Belgian-Style Black Beer. Conspiracy features a rich, spicy aroma with hints of dark fruit, raisin, roast and caramel. A toasted and slightly roasty flavor lead into caramel and a super smooth finish. Debittered black malt was used to get the jet-black color and tan head without adding significant roast flavor. The brewers also added Belgian candi sugar and Mexican Piloncillo sugar (a maple-sugar-like brown sugar) to increase fermentability and depth of flavor. Conspiracy comes in at 8.5 percent ABV and 25 IBUs. A release party is scheduled for Thursday, April 5 at 7 p.m. at the Horse Brass Pub, 4534 SE Belmont St . Gabe Fletcher (Head brewer at Midnight Sun) is making the trip to Portland for the release party and is also bringing along kegs of Midnight Sun's Envy Imperial Pils (9% ABV), Gluttony Triple IPA (11%) and FH Double IPA (9%). This will be a one-time-only chance to try these beers on draft outside of Alaska . All the beers will be tapped at 7pm. Conspiracy and Envy will be available at $3.50/glass & FH will cost $5/pint. There will also be a bottle release event on Friday, April 6 from 5-7 p.m. in the new café at Belmont Station. Gabe Fletcher & Ben Love will be there to pour and talk about Conspiracy. Guests will be able to purchase a 4oz taster or a bottle to enjoy there or take home. I'll mention it again as the events approach. Sounds interesting, though. Two bits of related news blew down the Gorge this weekend. First, the debut of Double Mountain Brewery, which opened its doors for the first time this weekend. For the moment, they're in transitional start-up mode, and are only open Thursday and Friday evenings and on the weekend (noon to close). 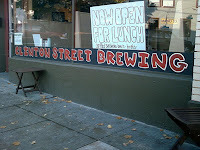 I saw one early review, which gave high marks for the pub ("great-looking") and beer ("layered complexity"). Maybe someone else will weigh in with an early report. The first is a brown ale featuring Gambrinus organic pils malt and specialties from Simpson and Crisp. The second effort, codenamed "India Red Ale" (aka "The I.R.A.") combines a ruby red color with a generous charge of whole flower Simcoe and Brewers' Gold in the hopback. Both ales were fermented with a versatile ale strain from Belgium supplied by our friends up the valley at Wyeast Labs, and will be served unfiltered. Basically we're looking to stretch the norm a bit and make some beers that true craft beer fanatics, i.e. you guys, will hopefully find interesting and unique. Hope you enjoy our 'work-in-progress'. You can taste their beers at the Oaks Bottom Public House tomorrow (Wednesday)--when the very first kegs arrive in Portland. "So, instead of pushing too hard, and not wanting to steal Double Mountain ’s opening thunder (Charlie and Matt used to work for me, and I wish them all the best), we’re going to target a later opening date." I had hoped to do a post on the troika of famous Irish stouts--Guinness, Murphy's, and Beamish, but I couldn't find the Beamish (which is the best of the three). Well, nevermind. May your day be free of blarney and your pint glass full of stout. Based on the response to the post below, there's a lot of love for the McMenamins out there. Although I totally stand behind my picks of the "best" (especially for firist-timers to Portland), I recognize that this is an inexact science. Which are your faves and which would you recommend to visitors to the city? And any love for the non-Portland outposts? Seattle has Starbucks, Detroit has General Motors, and Portland has the McMenamins, a constellation of the funkiest places to drink beer in the world. Brothers Mike and Brian McMenamin began building the "kingdom" in 1974 with the purchase of the Produce Row Cafe in the industrial (and now hipster) Southeast. It wasn't exactly a false start, but after mixed success there, they tried again in '83 and bought a pub on 17th and Hawthorne they dubbed the Barley Mill Pub (named for a mill rescued from Cartwright, Oregon's first micro), and their luck changed. In the intervening years, the McMenamins have become innovators many times over. They invented the concept of the theater pub when they opened the Mission Theater in 1987--a model that has spread not only throughout the city, but across the country. In 1990, they opened Edgefield, the first of their destination hotels; a 1911 poor house, it was converted into a European-style hotel, fully restored in the emerging McMenamin style--lots of funky artwork painted directly on the walls, antique fittings, and strange light fixtures. A cross between Dr. Seuss and Alice in Wonderland. The McMenamins greatest innovation--and their greatest legacy--is in converting historic old buildings that would otherwise languish or get destroyed. The brothers have a knack for finding a property that no one can make use of--elementary schools, flophouses, train depots--and turning them into irresistable destinations. The old buildings all receive the McMenamins' artistic touches, but they are all fully restored to historic standards. What results is a chain with 55 unique links (at last count). No visit to Portland is complete without a stop for a burger and beer, but since no one can visit every McPub, here are a half-dozen of the best. Nebraska Bitter - a wonderful summer pale ale, with lots of hop flavor without heavy bitterness (excellent). 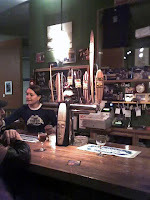 There are also rotating taps that include some special regular seasonals (Irish Stout is a standout) and brews brewed by the local brewer that are unique and probably on tap one time only. (These are where the regular beers come from--they gained popularity and became regulars.) Always ask what they have and if you're interested, ask for a taster. They're happy to indulge you. Now, without further ado, here are my picks for the best of the best. Even from the street, this looks like a cool place. A sliver of a building at the toe of Stark and Burnside, it was, when constructed in 1917, the smallest structure on the West Coast. It still has all its period detail and looks like it was flown in from Rotterdam. But the real joy awaits inside. Most of the McPubs in the 'burbs are pretty sterile affairs. Some actually inhabit--gasp!--strip malls. But Cornelius Pass is one of the more historic sites in Oregon, and even has a long history with the brewing industry. The background is worth repeating, but the real reason Cornelius Pass makes the list is because it's just a very cool place. Brief history: The Imbrie family bought the property in 1850, and began construction of buildings that still stand today--the granary (1850s), and the centerpiece Italian-influenced country home (1866). During the 1930s, Frank Imbrie began grain production, selling his barley to the famous (and now sadly defunct) Weinhard Brewery. The McMenamins saved the property from developers in the '80s, and in 2001, opened the signature Imbrie Hall, which was designed to look like a historic building and crafted from recovered materials. Of special note, the brothers managed to salvage some rafters from the Weinhard brewery, which closed during construction of Imbrie--bringing the relationship full circle. Cornelius Pass has many of the touches of the McMenamins' larger, destination hotels--wonderful landscaping punctuated by impressive architecture, hidey-holes, and fascinating little touches (a large photo gallery is here). In addition to the farmhouse and Imbrie Hall, there's the tiny little bar known as the Little White Shed--a characteristic McMenamins touch. It's a great place to hang out and wind down, especially in the summer, when you can sit outside and enjoy the grounds. There's even live music in the octagonal barn. I don't know that the McMenamins actually invented the idea of a theater pub, but they introduced it to Oregon in 1987 when they opened the Mission. (They probably invented it.) So prevalent is the concept now (the McMenamins have four) that distinguishing the Mission may seem passe. But for a couple of reasons, it still sets the standard. Most of the theater pubs in town emphasize the theater, but the Mission really feels like a pub. It's the only place that features a full menu, for example. But also, it has a pubby quality that encourages a raucous crowd. I specifically wait for some movies to appear at the Mission, knowing that the crowd will join in and enhance the experience (recent example: Borat). Second, they not only show movies, but special broadcasts like sports games (last year's Oregon State's College World Series run) and the Oscars. Forget sports bars--when you join a few hundred fans in a room with a movie-screen sized TV, it is amazing. We took my brother-in-law to see a Ducks football game last fall. As a diehard Bostonian and sports freak, he's not easy to impress, but eyes wide, he sat down and marveled, "This is tremendous!" Yes it is. The building that now houses the St Johns Pub has been through several incarnations and goes back to one of the most historic times in Portland history. We go back 102 years to 1905 when the City of Roses was vying to be the signature city of the Northwest (it was beating out Seattle at the time). As was the fad of the time, it staged a world fair--the Lewis and Clark Exposition, to celebrate the explorers' 100th anniversary. The building that became the St Johns Pub was originally the National Cash Register Company building. Almost all of the exhibits were destroyed after the Exposition, but this building managed to survive. It has been home to churches and the American Legion. Old buildings are not, by dint of history, cool. Besides its amazing history, the SJP is a wonderful building. The pub proper has two levels, a downstairs, outfitted with dozens of Suessian lamps, feels like a slightly off English Pub, and the upstairs has a cozier, rumpus-room feel. The theater, which was formerly a live-music venue, features a stunning dome with a distinct ecclesiastical vibe--it's not surprising that it was formerly co-opted by churches. It's also one of the few dual-duty pubs in terms of weather. I find it among the coziest spaces in winter, and in the summer, there's a lovely shaded garden sprinkled with fairly private picnic tables. It's cool and pleasant on a hot day. It's a bit out of the way for most people, but worth a visit. White Eagle Saloon - 836 N. Russell St. 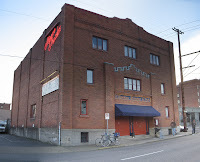 Unlike most of the McMenamin properties, the building housing the White Eagle has always been a bar. Located in a roughneck neighborhood on the edge of the Swan Island shipyards, it has a . . . colorful history. From rumors of tunnels under the bar where drunks were shanghai'ed to murdered prostitutes to prohibition moonshine--the White Eagle is the object of many legends. Some may be true. In any case, it has the straightforward feel of an old American tavern--those smoky corner spots that predated light-filled brewpubs. It is long and skinny and close-feeling; the kind of place you can walk into and survey for familiar faces. These older charms translate well to modern tastes, from the exposed brick to the impressive bar. The McMenamins have a sixth sense about the trends of the city, too--they bought the White Eagle at just the moment that the sleeply little working-class neighborhood turned industrial hip in the late 90s. It's still a cool part of town and mostly off the beaten path. As the McMenamins never do things simply, it has some add-ons, including a small stage for regular live music, outdoor seating, and a few hotel rooms upstairs. I have yet to speak to anyone who's actually stayed there--sleeping above a bar isn't everyone's cup of tea--but you can't argue with the prices, which range from $40-$60. There are a few places I always take visitors to Portland--the Rose Garden, Powell's, and the Kennedy School. If they're into beer, I take 'em to a brewpub or two instead, but for a purely Portland experience, you can't do much better than the Kennedy School. A transformed 1915 elementary school in Northeast Portland, it was an albatross for over 20 years between 1975 and 1997. No one knew what to do with it. The McBrothers did. They adopted the model pioneered at the Edgefield and converted the classrooms into hotel rooms, turned the gym into a movie theater, scattered pubs and restaurants throughout. They even converted a few of the rooms into conference and ballroom space. On most weekends, you'll see a wedding in the second gym. I attended a conference and watched a political campaign get launched there. In fact, when they opened, they offered the space free to local groups. But the real attraction is the harmony of space and art. 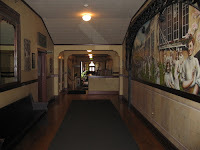 It still retains its school-y feel, and the McMenamins enhance it with artwork celebrating the staff and students who walked the halls. It includes paintings, mosaics, and sculpture--all with a whimsy suiting both a pub and a school. One tiny nook has been converted into the "Detention Pub," and captures the illicit feel you find in all schools. It's one of the few smoking areas, is for adults only, and has a nice liquor selection. Part teachers' lounge, part behind-the-bleachers hideout. The Kennedy School communicates, more clearly than anyplace in the city, what Portland is all about--innovation, relation, art, and community. PHOTO CREDITS: Strawberry [Mission], Queenie Carly [Kennedy School], Oregon State University [Mike and Brian McMenamin], all others from the McMenamins. Tomorrow morning I'll post my latest installment in my visitor's guide (aka Best of Beervana). The post will highlight the McMenamins, a phenomenon that, for most Oregonians, is so common we almost fail to notice it. In fact, we owe an enormous debt to the McBrothers not only for saving dozens of historic buildings (and turning them into something way cooler than museums), but for laying the groundwork for beer culture here. Would Portland/Oregon be Beervana without the McMenamins? Maybe not. Anyway, it's familiar terrain for regular readers, but I hope newbies enjoy. If I can rustle up forty bucks, I plan to go. And hey, it's the Ides of April--either your taxes are in, or you're on the lam from the law; either way, drinking good beer is a fine place to be. "It has the classic IPA character--a cloudy golden brew bubbling with citrusy hop aroma, but ultimately a beer like so many others. It's very tasty, but somehow hard to distinguish from the 37 other IPAs I had this year." But by eight ounces (I'm working in approximations here), it had warmed a little, opened up, and revealed a few of its hidden secrets. I ended up with an entirely different impression. To back up a bit, Slipknot is an "imperial IPA," a new designation that is meant to indicate strength and heft and generally excite beer drinkers. I think it muddies the water, especially when you're already talking about a big style of beer. Imperial stouts are more than twice as strong as Irish stouts--here "imperial" communicates something. But with Slipknot, we have a relatively hoppy (though not super hoppy) 7.8% beer. Back in the day (1997), we'd have called it an IPA. Let's dispense with the profligate "imperializing" of everything, shall we? Okay, back to Slipknot. The aroma, to add to the description above, springs out of the glass. Citrus is the central aroma, but has a delicate blossom quality, too--it's a surprisingly fresh-smelling beer. As I mentioned, it starts indistinctly--tasty, but not something you think you could pull out of a line-up. As it warmed, though, the hop notes deepened and I picked up strong black pepper notes and a kind of resinous "cattiness" (which in this case was a good thing). There are plenty of residual sugars, which bouy the beer as you go along--the bitterness never threatens to overwhelm the palate. A winner. Rating: Good (first few ounces) then excellent. I have been remiss in touring beer blogs lately, for otherwise I would have known about this "beer blogging Friday" business (which beats Friday Cat Blogging by about 47 miles). I suspect I will not join this effort, for I am neither very good at timelines nor interested in group efforts. Today beer bloggers are supposed to be touching on the subject "Not your father's Irish stout," and from that title you can see from whence comes my reluctance. (On the other hand, I actually was in strange synchronicity with the effort when I posted, two days early, on Roots' imperial stout). Therefore, a haiku instead, with an effort to at least nod in the direction of the Friday beer bloggers. I calls 'er "Stout." To really reach its potential, this beer should probably never be served greener than a year old --which for a brewery is financially unviable. (You can, of course, by an $85 jeraboam, but at 3.3 liters, it presents its own problems.) Anyway, here are my notes: looks like viscous Coca Cola in its little serving goblet. Lacks much aroma--just a thick, barleywine malt faintness. It is rich with dark fruit and candied orange flavor, followed up by a sharp hop bitterness that keeps the beer from cloying. In a year, probably amazing; from the tap, an interesting, very intense ride. Exquisite. Ultra creamy and misleadingly delicate. A friend described it as an Irish type stout, and I thought he was just being dim. But it's true--the density and alcohol are lost in a froth of chocolatey creaminess. It does finish dry, and is more akin to a dry Irish than sweet stout, but bears no resemblance to an imperial. Never mind, it's amazing.